We are a gift-based, volunteer driven church. Each believer will find his greatest joy and fulfillment when they are Spirit-filled and serving in their spiritual gifts and passion. Every believer is created for ministry, gifted for ministry, authorized for ministry, and needed for ministry. If your gift is serving others, serve them well. If you are a teacher, teach well. If your gift is to encourage others, be encouraging. If it is giving, give generously. If God has given you leadership ability, take the responsibility seriously. And if you have a gift for showing kindness to others, do it gladly. To bring a message of hope, to model the love and compassion of Jesus Christ to those in need by providing food, prayer and encouragement to those who are enduring tough financial times every month at the New Hope Ministry Center. Application forms for assistance are available at the Concierge Services table at our weekend gatherings. 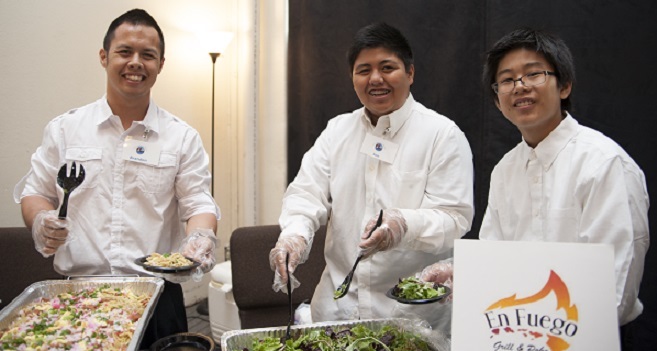 If you like to help by extending the Heart of Christ to others and create an environment in which meaningful connections can take place at our Gatherings, then the Hospitality Ministry may be for you. You can prepare a hot cup of coffee, serve a cold cup of water, or a tasty treat - all are expressions of God’s heart of welcome. We strive to share the art of Gracie Jiu-Jitsu in a welcoming and family-oriented environment, in which members can also fellowship and build genuine relationships with one another. All are welcome - church members, non-members, families, women, and children of any level can join us. Classes are taught under the direction of Shane Nakagawara and Justin Nihei. Help connect both newcomers and regulars with what they are looking for at NHK. Assist in facilitating distraction free Gatherings by seating people. Also distribute and collect items as needed during the gatherings. Set up and take down of facilities before and after services. Partnering with people in praying with and for the needs and requests of others. Extending the welcoming arms of Jesus to all who pass through our doors. Filming, editing, and/or producing videos to communicate God's message.